High 'Fusion' stretch cotton jersey, wide, short-sleeved, mixed print fabrics t-shirt. Round neck with raw, rolled trim. 5 different fabrics are used to create this wonderful t-shirt. 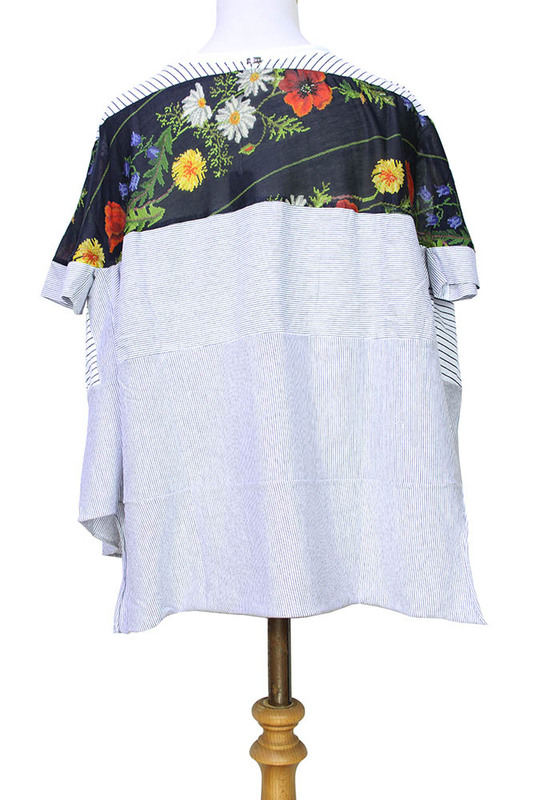 Narrow and wide pinstripes, fine cotton with stylised flower prints and appliqu�d flower printed, pinstripe panel below neck at the front. Short-sleeves in fine printed cotton with fine pinstripe, doubled fabric cuffs. Flower patterned border at front hem. 3 progressive levels of hem, shorter at the front and progressing in steps to the rear. Panel constructed. This is a wonderful Summer top, elaborate, with a great drape, highly recommended!